Transparency and public trust were key issues discussed by school board candidates at a forum Monday evening at the Community Campus in Hailey. School board Chairman Steve Guthrie, who is seeking a second four-year term, said the district has made progress the past few years in reaching out to the community. He cited a recent award from the Sunshine Review for transparency on the Blaine County School District website and said that in the past few years district administrators and school board members have reached out to the public with monthly “Coffee with the Community” gatherings and with monthly special workshops. 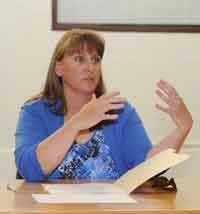 Candidate Kathy Baker agreed that there’s room for improvement. Guthrie and Baker are both seeking the School District Zone 2 trustee seat in an election that will be decided on May 21 in conjunction with the state primary election. Zone 2 mainly encompasses the southern Hailey area. About 65 people attended the candidates’ forum that was hosted by the Blaine County Education Foundation. Jenny Emery-Davidson, director of the College of Southern Idaho Blaine County Center, served as moderator. Emery-Davidson asked the candidates a series of questions before opening the discussion up for questions from the audience. Baker said she has lived in the Wood River Valley for 13 years and that she’s “currently a mother and a full-time volunteer,” noting that she has been involved with parent-teacher associations, a district science textbook selection committee and numerous other school activities. “I’ve spent hundreds of hours in our schools and I’m an advocate for our students,” Baker said. Guthrie, who was first elected to the school board in 2009, said he has lived in the Wood River Valley for almost 30 years, has owned and operated retail sales businesses and is currently security coordinator at Friedman Memorial Airport. Guthrie said he has been a volunteer with the district for about 12 years. On another issue, Baker said the district is not getting enough performance for the money it spends on students. “I think the School District is performing adequately, but not world class,” she said. Guthrie said the district is making progress by implementing a world languages program, by offering International Baccalaureate classes, by offering more advanced-placement college courses and by furthering technology instruction. “I think the district does a fabulous job in offering all students many opportunities,” Guthrie said. Both candidates asked for votes in their closing remarks. “I would ask for your support on May 21 and I would work just as hard as I have for four more years,” Guthrie said. “I hope that I can have your vote because I am so passionate about our schools,” Baker said.